To anyone who has visited our blog more than, well, once, it probably goes without saying that we like big stupid cars. I like them with big, gas guzzling V8 motors, all the creature comforts, and I am particularly fond of the big German ones that look like they belong to a master villain from some cheesey 1980s movie. 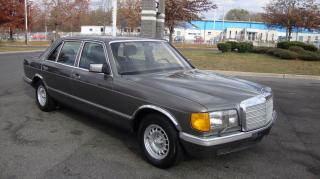 Cars like this 1983 Mercedes-Benz 500SEL.